If you are not familiar with Jason Momoa’s personality, you are definitely in for a surprise. His roles don’t introduce him as who he truly is. For example, Khal Drogo is exactly the opposite of who the handsome actor really is. He is every woman’s dream and that fierce look should not deceive you because he is actually a sweetheart! Momoa is a fun and lovable guy who has a lot of love for his family, friends and pets. Even better, the famous actor has a specific sense of humor and he seems to always be in the mood for pulling a joke on someone. This is something he is so good at that it is worth telling a few stories just to highlight it. He loves trolling his fellow cast members and colleagues. Another thing about him that impresses as is his strong personality and the fact that all his emotions are literally written on his face! As you are about to see, his sense of humor can strike anytime and the unsuspecting victims’ reactions are priceless. Sit back and have fun with the hilarious moments created by this amazing person’s attitude! If you didn’t like Jason Momoa until now, you will definitely become a fan! We can imagine that every couple would find it hard to guess what to expect from a photo shoot with Jason Momoa. We know what he’s made of and we would expect that such an experience would be a lot of fun. 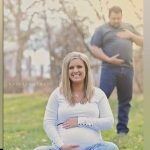 As you can see, this couple got more than they bargained for and the pictures are hilarious. The pretended to punch the man while hugging his lady, and everyone’s faces are completely obsessed with their roles. 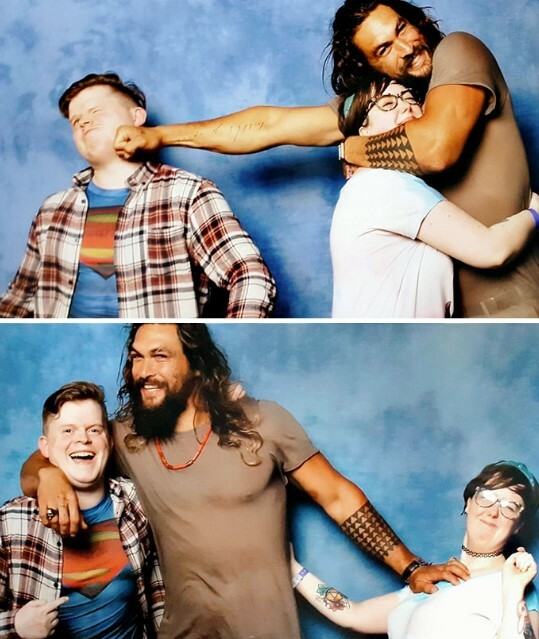 After completely nailing the first photo, Momoa decided to compensate the poor person after the knuckle sandwich he threw at him. The actor actually pushed the woman to the side while hugging her man! We love these photos! As you already know, most girls would go crazy if Jason Momoa is somewhere around them. The hunk is a chick magnet and the reasons for that are more than obvious. However, we need to specify that he is happily married and that fact probably continues to break a lot of hearts. Of course, knowing that he has a lovely wife would never stop girls from chasing him. For the sake of the photo, he pretended that he would try and steal this girl from her man, and he seems to be pleased with that. The lady in his arms probably doesn’t mind his attention but the same thing cannot be said about her partner. All he could do is just stand on one side and watch helplessly what happens. If this was a real situation, you can bet that almost nobody could actually do something about it. 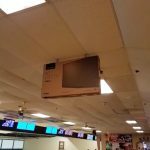 This story is a bit different than those we already showed you. 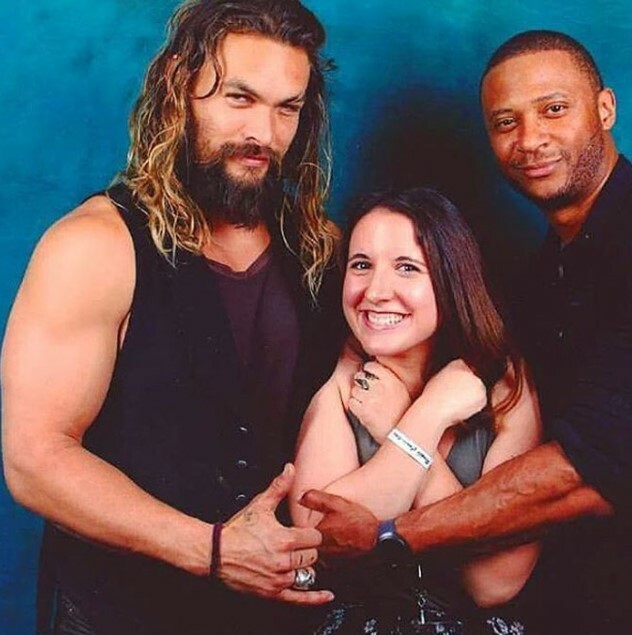 The woman wanted to have here photo taken with Momoa but she did not want her husband to be featured. However, he insisted, but it seems that the actor supported the woman’s decision and the end result is more than hilarious. The woman seems to be happy because she kind of got what she wanted initially. 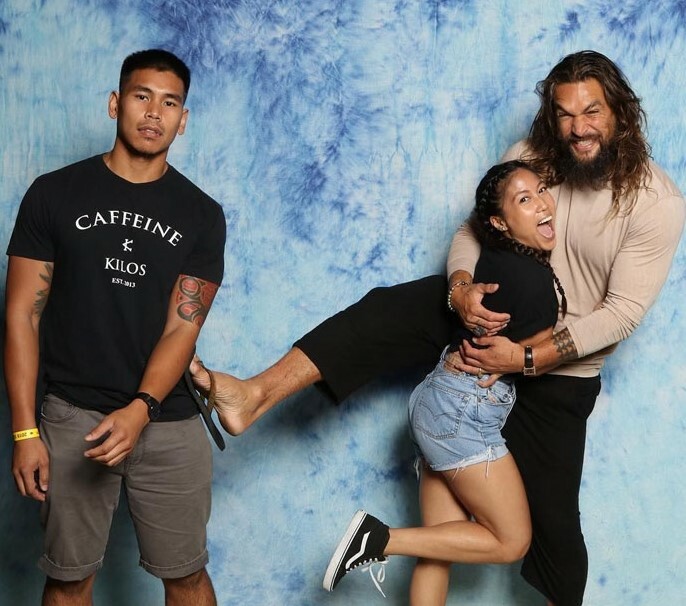 Maybe her partner wanted to make sure that she will be able to resist Momoa’s charm, but he surely did not expect the photo setup they chose. The final detail in the photo was done only after it was taken and printed afterwards. 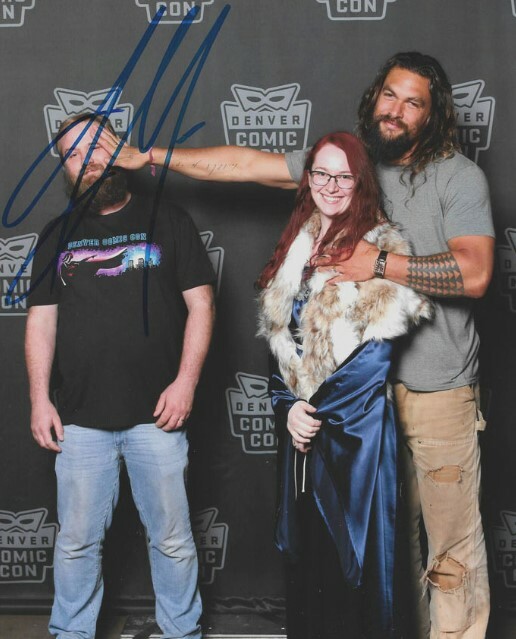 Momoa signed the photo, but he deliberately put his signature all over the man’s face! He is a real savage! This photo is another proof that if your woman is next to Jason Momoa, you need to be close to her just to make sure. It is clear to see that he enjoys taking the camera’s attention and this is nothing to wonder about. After all, Momoa is an actor and the camera loves him. The woman in this photo appears to be overwhelmed with joy while her partner looks as if he is over everything he sees and accepts is a joke. However, seeing where Momoa’s foot is makes you think that he will not allow anyone to come close. The woman’s partner has only one option and that is to accept the situation. 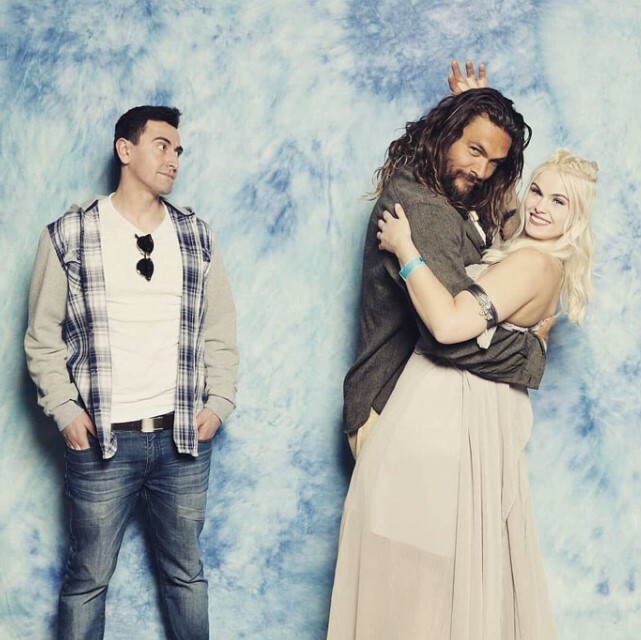 The previous examples of couples taking photos with Jason Momoa all had one thing in common. All the men from the couples seemed more amused than annoyed in the pictures. This time it is different and the person on the far left does not seem pleased that the actor pushed him away while hugging his girl. Showing some attitude is definitely a good thing but his reaction is not as interesting as the reaction of his girl! She appears to be almost hysterical about the fact that she is Jason Momoa’s arms. After all this is the stuff of what most women’s dreams are made of! 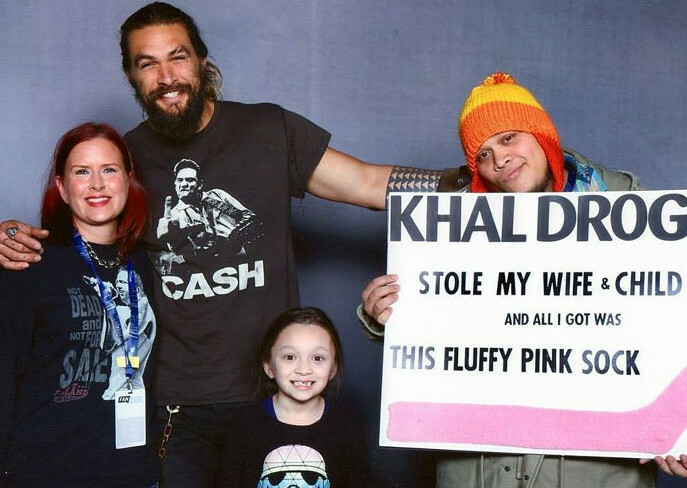 The photo is another sweet example of Momoa’s perfect sense of humor in action. This cute couple decided to attend the Calgary Expo and have some fun. When they realized they have the chance to meet the actor, they did not hesitate for a second. However, the person on the left probably expected a different outcome of the situation but he should have known better! Every Jason Momoa fan should know that he constantly trolls people! 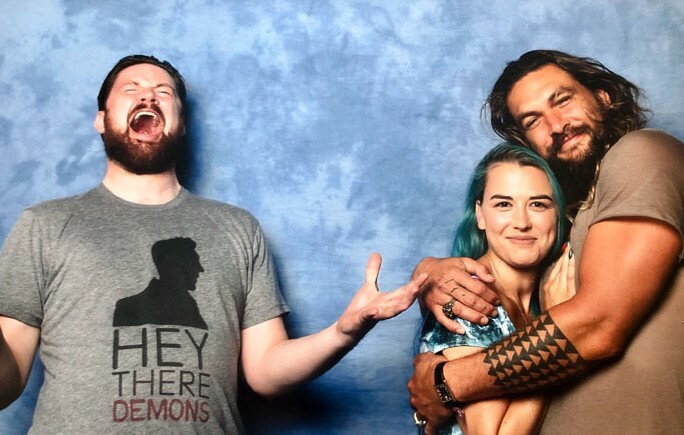 The reaction of the man is really funny but his girl and Momoa could not care less. 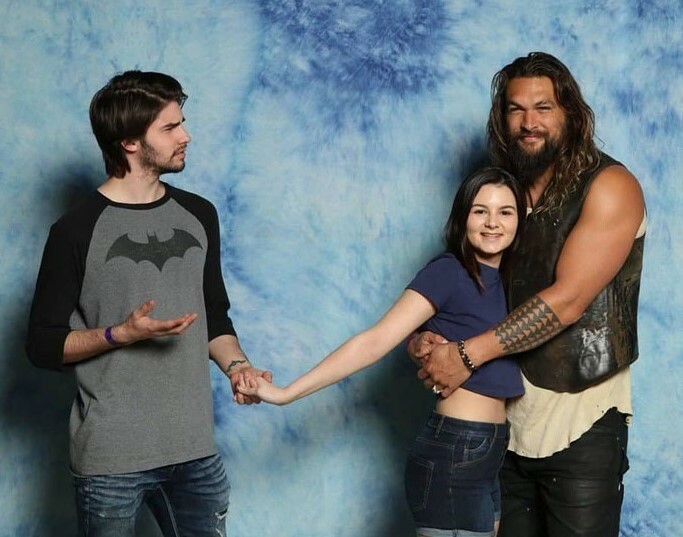 It seems that every couple who wants to take a photo with Jason Momoa should expect the same setup. The actor always pushes away the man and takes the woman close to him. In this case he went a bit further and he stole the whole family. The head of the family seems a bit confused but he realized there was nothing he could do. His family, however, is having a blast! 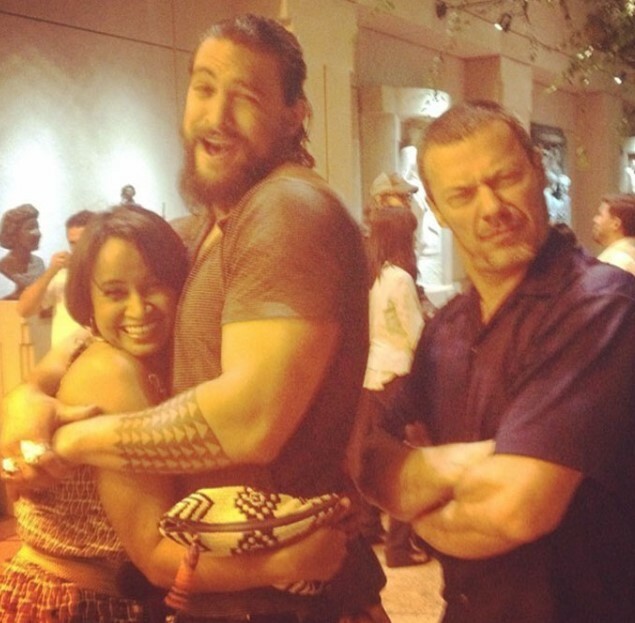 The woman and her son are enjoying Momoa’s close company! 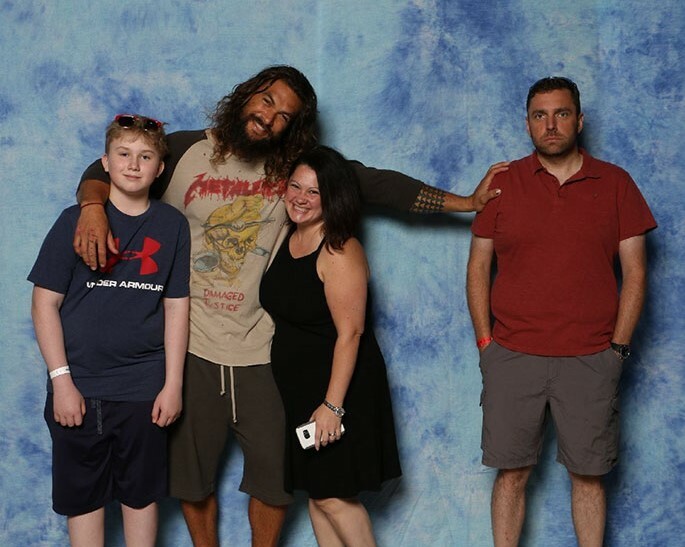 We firmly believe that the whole family would never forget the day they decided to take a photo with Jason Momoa. It seems that some of the husbands take it hard but there is nothing that could be done. Perhaps only a few men would stand against Jason Momoa and confront him! This image was obviously not part of a photo shoot, but the actor appears to be equally happy to troll the man by hugging his wife and literally keeping him out of the picture. The man does not seem happy and his grumpy face says it all, but as we already mentioned, all he could do is accept the situation and cope with the fact that his partner enjoyed the actor’s hugs! It might seem that all the photos on the list are pretty much the same, but they all show different emotions and reactions. This is what makes them interesting in a unique way. Talking about emotions, just take a look at the man on the left! 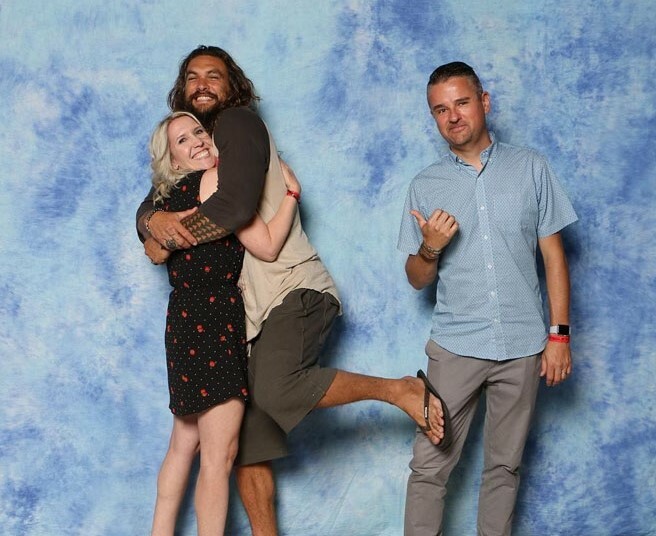 He clearly did not accept the fact that his wife enjoyed Momoa’s hugs! She seems to be enjoying the few minutes of celebrity attention and nobody could blame her. Every woman would like to be in her spot for sure! However, we need to make something clear about all the photos in the list. Everything was done on purpose and was agreed upon before those photos were uploaded on social media. The couples did not expect Momoa to troll them but most of them played along and reacted in funny ways. All the photos on the list had one thing in common. In every single one of them Jason Momoa separated the couples and trolled the men, but this time things took an unexpected turn. The actor actually decided to join the couple instead of separating the love birds! The woman seems to be pleased and she has every reason to be! She has her man on one side and one of the most famous actors in the world on the other! It is like a dream come true for the majority of ladies and she got to live that dream for a couple of minutes. Jason showed that he can be generous instead of trolling the unsuspecting people. Meeting him is definitely an amazing experience and everyone who had the honor will cherish the sweet memory for a long time!